Wait, let me close the window because a light fog just rolled in and I don't want to get cold here. You know, the town where they'll never play another PGA in my lifetime. The game stories were all a bit different but everyone focused on the 18th hole scene surrounding Tiger's quest for yet another record. Here's Steve Elling's game story, Doug Ferguson's AP piece, and from the other side of the pond, James Corrigan filing for the Independent and Lawrence Donegan with a lively account that Guardian readers will enjoy. To put the 63 into a little context, here's my Links cover story from earlier this year looking at the vaunted 63 mark and various theories as to why it hasn't been broken. They also posted a list of the other 63's. Michael Bamberger says the 63 was another reminder of how easy Tiger can make it look and that the PGA will be the key to breaking Jack's record. He'll get to 18 because the PGA is a relatively easy win for him. It has a deep field — advertised as the strongest field of any tournament except the Players Championship — but few golfers in the dog days of August are ready to take on Woods in full throttle. Angel Cabrera, the U.S. Open champion, and Zach Johnson, the Masters champion, both missed the cut here at Southern Hills. Both looked worn out, Cabrera physically, Johnson mentally. The sauna-like conditions will do that to you, but the PGA is hot most years. Tiger used to perspire like crazy, but at Tulsa on Friday he looked like an ad for some new Nike product, one that takes perspiration and turns it into some sort of cash-and-prizes incentive system. Jim Furyk is playing hurt, Vijay Singh is off his game, Bob May's not in the field, John Daly's 100 pounds overweight, and Woods is 7-0 in majors where he leads after 36 holes — who's going to beat him? Who has his level of intensity and desire and fitness? Nobody. Mark Lamport Stokes reports on Paul McGinley's hardly-noticed 66. Gary Van Sickle is rooting for Scott Verplank because the OSU grad doesn't take himself too seriously. 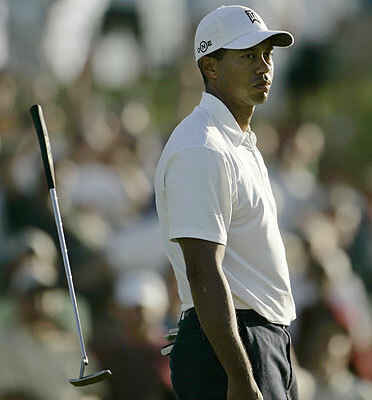 Jeff Rude says Tiger's use of irons off the tee is almost a replay of Hoylake last year. John Antonini wonders about several fun things over at Golf Digest's Local Knowledge blog. These Sports Network notes put Tiger's 63 into context and they tie up several other odds and ends. Thomas Bonk starts out his notes with a look at Phil Mickelson's position at two-over. Doug Ferguson starts his notes off with news that Lucas Glover and John Rollins are hoping to make the President's Cup team. Wait, we did that last year. No other young Americans have emerged? Can we claim Andres Romero? Nope, Ferguson says he's on the bubble for the International squad. Chris Lewis is glad not to be at Southern Hills and notes those AmEx ads starring Shaun White. GolfDigest.com's photos are here, GolfChannel.com here and golf.com here. Thing is, Daly doesn’t do anything by anybody’s plans. Never has. Which is why, despite the blistering heat and suffocating humidity, a Tiger-sized gallery was following every move of the topsy-turvy 3-over 73 that turned him back into America’s favorite side show after a brief stay atop the leaderboard at the PGA Championship. Whoa...guess the charges weren't filed. Just two months ago, Daly showed up at a tour stop in Memphis with a face full of scratches that he blamed on Sherrie, saying she came after him with a steak knife. They’ve since reconciled. Or at least are getting along well enough for to come to Southern Hills with the kids. Don’t ask about it, though. “That’s where we end,” Sherrie Daly said. But it’s hard not to love the big lug. That’s why the people keep showing up. Well maybe if you weren't trying to kill him!